Albany, KY, the Clinton County seat, and Burkesville, KY feature over 2,000 miles of shoreline for fishing, lake accommodations and water recreation. We're served by State Highways 553 and 1590, and US Highway 127, close to Lexington and Louisville, KY, only about 116 miles to Knoxville, TN, and 130 miles to Nashville, TN. 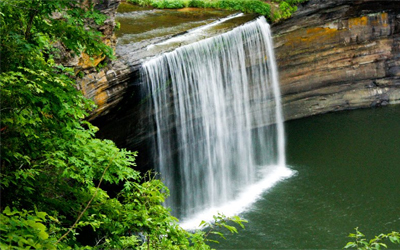 The Albany/Burkesville, Kentucky area offers two beautiful Lakes, Dale Hollow Lake and Lake Cumberland's scenic beauty, wonderful waterfalls, hiking, kayaking, trail riding, canoeing and outstanding hunting, there's something here for just about everyone. The United Country office in Albany, KY features listings throughout southern KY including Albany and Burkesville, Kentucky recreational property, Cumberland County, KY country homes, Clinton County farms and ranches and fine KY hunting land. Lakes and Land Realty/Auction is eager to work with you to meet your buying or selling needs. Albany, Kentucky was established in 1837 on the site of a tavern owned by Benny Dowell. The name derived from the city in New York. The Paoli post office opened in 1833 and moved to Albany in 1837. Clinton County, KY itself was formed in 1836 and is located in the Pennyrile region of the state. Elevation ranges from 530 to 1,780 feet above sea level. A local interest is the Foothills Festival, which is held annually on the Albany Town Square. The festival lasts 9 days and has main featured events as well as art and craft displays, a flea market, great food, rides, contests, pageants, live music and more. Lake Cumberland is one of the largest man-made lakes east of the Mississippi River and covers 63,000+ acres with over 1,255 miles of shoreline. There's also Lake Cumberland State Resort Park. Dale Hollow Lake is a fisherman's paradise, home to the world record smallmouth bass and truly a Mecca for vacationers, retirees or anyone looking for a quiet place to relax. Whether it's great fishing, excellent hunting or mountain view golfing, relaxing at Lake Cumberland and Dale Hollow Lake state parks or just enjoying the good life, there's something here for just about everyone! United Country Real Estate | Lakes and Land Realty/Auction can help you realize your dreams.